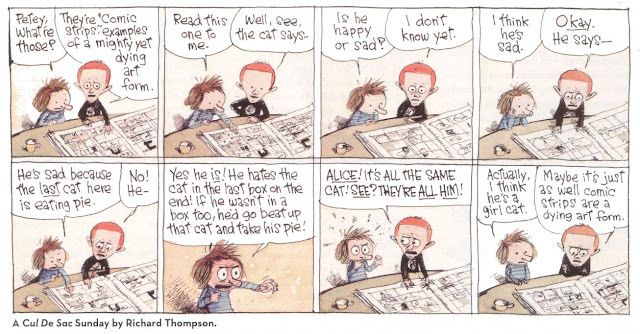 In a recent Facebook note about cartoonist Richard Thompson’s decision to quit doing his comic strip “Cul de Sac,” I called it “the best comic strip being drawn today.” That's not praise I lavish lightly. I mean it. Now I aim to defend that opinion. I’m not going to rage against Parkinson’s disease, which Richard has and is why he's quitting his 5-year-old strip (and was also the reason for the “Team Cul de Sac” fundraising book and art auction, to which I was honored to contribute a page). It’s an awful degenerative disease and it’s terrible that Richard is afflicted with it, and what more can be said? Nor do I have much to contribute to testimonials about what a swell guy Richard is because I don’t really know him. Everyone who does know him says he’s swell, and his peers in the National Cartoonists' Society named him their 2011 "Cartoonist of the Year," to which my second-hand opinion adds nothing. Instead, I thought I’d explain why I think “Cul de Sac” is the best comic strip being drawn today. What I—someone who loves comics, studies comics, makes comics, and aspires to make better comics—see when I look at Richard’s. I considered posting and dissecting some of his strips but quickly concluded that wouldn’t work, although I do a bit of it below. Which strips to pick? One mark of “Cul de Sac’s” excellence is that you could choose any dozen strips at random and find something admirable and teachable in nearly all of them. In fact, I simply did a Google Image search and chose the first 30 that popped up, from which I culled these examples. I confess that a recent post by Comics Reporter Tom Spurgeon asking his readers to pick their favorites turned up some good ones and was a big help. I love that borderless second panel of Alice running, her scarf blowing behind her. The first panel is a moment of self-recognition for me: you think your kid is going to be the next Olympic champion when all they really want to do is splash around in the wading pool. And the third panel is the twist: who you think your kids are versus who they actually are. I have been this parent, although I like to think I always made time to push a swing. I assured her that he was one of the best, maybe an all-time great. I sympathize. Sometimes it is hard to tell! The fact is, you don’t have to be a great artist to be a very successful cartoonist. There was a time you had to at least be a competent one, but those days gave way to valuing authentic authorial voices over skillful rendering. What a creator had to say became more important than how they said it. You can dress it up any way you want, and I strongly defend the proposition that a bad artist can still be a great cartoonist, but the fact remains that some simply can’t draw. Their work looks crude and simple, almost child-like. Which is exactly how the work of the very best cartoonists can look, too. How’s the reader supposed to tell? I have also been this parent. Remembering how much I hated being embarrassed when I was a kid, I'm sometimes amazed by how much I enjoy dishing it out to my own children. We've all had a kid stare at us like this, but I don't recall any cartoonist or comedian noting it before. Petey's bulbous head and wide eyes peeking over the seat in Panel 4 are the perfect punctuation. Even Mom is sneaking a peek. This situation is not improving. When I look at “Cul de Sac,” I see the work of an artist who completed the Picassoesque loop from simplicity through mastery all the way back to (apparent) simplicity. Unlike unskilled artists who avoid portraying things they can’t draw (often hands and feet, and I’ve confessed my own challenges with cars), Richard can draw anything. An unskilled artist’s world is small, their settings constrained to the same shapeless couch, office cubicle, or unconvincing shrub. 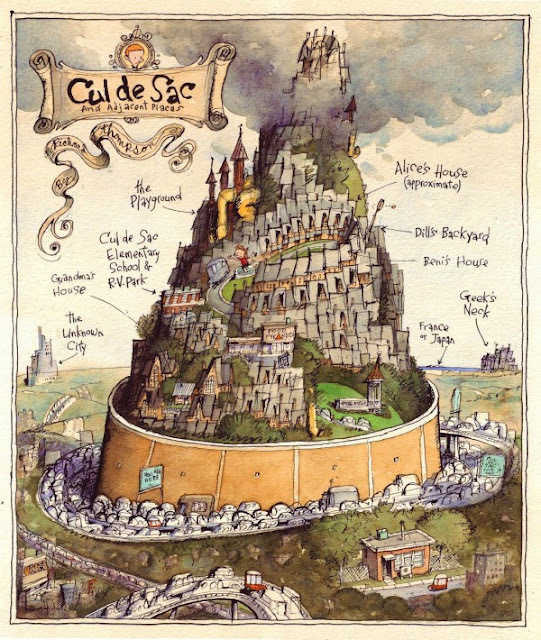 The “Cul de Sac” world is vast—limitless!—and always distilled to its essence so that the reader knows where they are without a wasted detail. His objects have volume and mass, shape and shadow. When his perspective is wonky, it’s wonky with a purpose. Like they say, he works very hard to make it look so easy. Beautiful art, costumes and expressions. How far apart can the universes of people living in the same house be? Alice's haunted gaze in Panel 4 slays me. This is one of my favorites. Richard’s art is a bit of a throwback. Let’s spin that positively and call it “timeless.” He uses dip-pen nibs and ink, favoring the classic Hunt #101 Imperial. 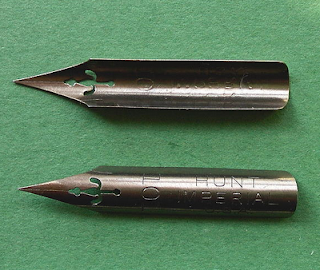 Ink-dipped nibs were predominantly used to draw newspaper comics from their invention until maybe the 1940s and ‘50s, when artists like Milton Caniff (“Terry and the Pirates”) and Walt Kelly (“Pogo”) made brushes cool. Brushes and nibs shared cartoonists’ affections (and of course many artists used both) for decades. Both tools let an artist vary line width by bearing down or lightening pressure, creating lively lines with motion, mass, personality. Both also take time and practice to master. When you’re in the zone, the nib or brush becomes an extension of your brain. In recent years, more and more artists use technical pens, Staedtlers or Microns (basically permanent-ink felt-tips), or work digitally directly on the computer. Those are easier to control but, unless the artist is skilled and careful, the resulting line art can look uniform, sterile and dead. Pen guys like Richard and brush guys like me are increasingly considered dinosaurs. Richard’s scritchy pen line is alive with nervous energy. It practically vibrates. It may look spontaneous and sloppy but in fact it’s quite thoughtful and disciplined. Confident. One way to tell: you never have to stop to figure out what something is or what’s going on. 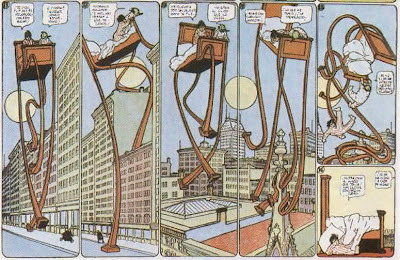 Richard would’ve fit right alongside the great Cliff Sterrett (“Polly and Her Pals”) and George Herriman (“Krazy Kat”) 70 years ago but shines like a lonely beacon of quirk and quality on the contemporary comics page. So in the same way a carpenter might admire another woodworker’s fine dovetailing, I see a craftsman who knows how to use his tools. I am always a sucker for an outer space gag, but the idea of drawing the garbage in orbit literally piling up overhead would not have occurred to me in a hundred years. This is one of those representations that looks easy and obvious until you realize you couldn't have done it yourself. “Cul de Sac’s” characters have distinct personalities without descending to simple archetypes. They can’t be summed up in one word. Richard calls his protagonist, 4-year-old Alice, a “fireball.” She’s a creative, extroverted, anarchic narcissist. Something I once said about Jeff Kinney’s Wimpy Kid, Greg Heffley, applies to Alice as well: she always tries to do the right thing, as long as it’s the right thing for her. Alice’s brother, 8-year-old Petey, is a neurotic, introspective oddball with a passion for making shoebox dioramas. Mom and Dad mean well but don’t seem entirely up to the challenge of wrangling these two kids, who’ll probably turn out all right anyway. Because most kids do. The strip’s deep supporting cast has its own quirks and foibles, none of them completely admirable but all clearly loved by Richard. "P.J. Piehole's" is funny. Petey's neurotic fear of being crushed by restaurant decor is funny. But the best part is his family's total indifference to his terror. That's a lot of funny (and a little bittersweetness) packed into four panels. Reminds me of the "Calvin and Hobbes" gag in which Calvin's Dad explained how the world used to be in black and white until the 1930s. 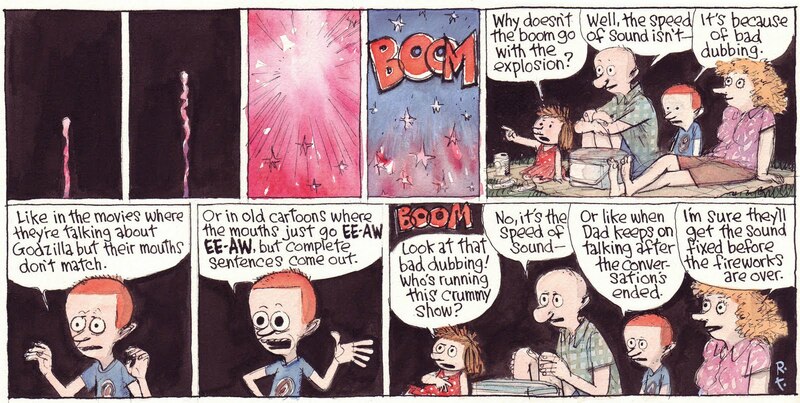 In this case, Dad tries to explain the science while Petey gets it wrong (does he believe what he says? I don't know!) and the best part: Mom buys in. 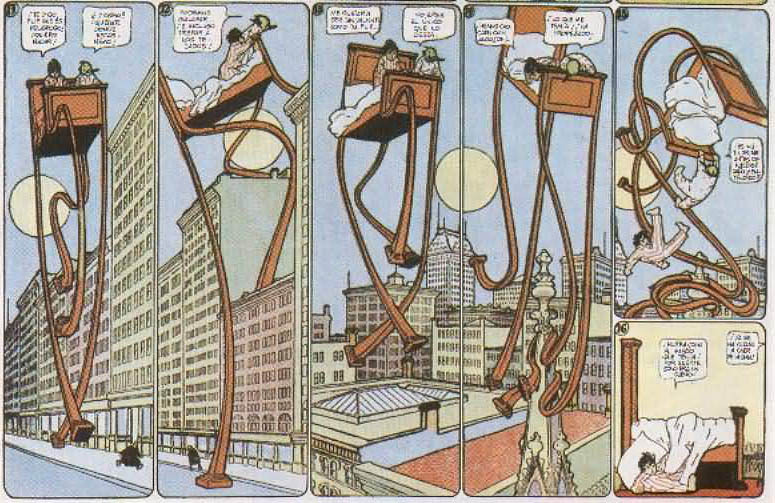 This is Alice's naive friend Dill in an homage to the classic comic strip "Little Nemo in Slumberland," particularly a storyline in which Nemo's bed came to life and carried him away. Thompson is very aware of Nemo; Petey's favorite comic book is "Little Neuro," the adventures of a boy too afraid to do anything. In my opinion, “Cul de Sac” meets the gold standard of relatability—that quality of telling you something you always knew in a way you’d never thought about it—primarily (I surmise) because Richard remembers what it was like to be a kid, turned loose in a neighborhood where every storm drain hides an underground world and a playground slide could be a portal to another dimension. He’s good at taking a surprising left turn that pivots on the perfectly chosen word, or tying up scattered threads of story in a perfectly composed little bow. In sum, for me, “Cul de Sac” operates at a level of skill and ambition other cartoonists don’t often shoot for and some may not even comprehend. It’s smart, sweet but not saccharine, dark but not cynical, and artistic but not impenetrable. It’s reportedly carried in 250 newspapers, which is respectable but not spectacular. It should be in 10 times that number, and the fact that it isn’t is an indictment of something—I don’t know what. Clueless readers, tasteless editors, modern micro-attention spans, or the slow decline of newspapers. It is the best comic strip being drawn today, and it will be until the last one runs on Sept. 23. All my best to Richard and his family, with thanks. A brilliant homage. I like it when you explain things about art, because you manage to be technical without being impenetrable or overly wonky, and I like it even more when you are explaining work that I happen to love. And especially because, when you're done, I don't love it any less or feel like I have to start looking at it like I know how the parts fit together. Thanks, Mike and John. Your opinions mean a lot to me. Thanks Brian, That is a great piece. You've helped me to understand the Cul De Sac mania a bit better. That's what I was hoping would happen. Beautiful post, on an amazing comic strip, Brian. Thank you.